It may feel more like September than December when we step outside, but the school run first thing in the morning is still pretty chilly and Finn likes being wrapped up warm in a snowsuit. We haven't had to dig out the serious waterproof one we will take skiing, but the lovely people at Little Green Radicals sent us something perfect for this cold weather. I just love the enchanted wood print and the bluey-green coloured background. My favourite thing has to be the inside though, which is soft and fluffy made from organic sherpa cotton. The legs and arms can be folded over to cover little fingers and toes, although my long-legged one can't have his feet inside so we pair it with soft-sole boots. The kimono style opening makes it really easy to put on and take off and the lack of padding makes it ideal for babywearing. Finn seems to be snug and warm inside and the fit is great on him. I would say it is pretty true to size, Finn is wearing the 6-9 months here, and at 9 months old he is at the top end of most 6-9 clothing now, not quite into 9-12 months yet. It is only the legs that are getting short, but this is a problem we have quite often. If you fancy something a little more feminine, this snowsuit also comes in a pink 'birdcage' print that is equally gorgeous, however I think the enchanted castle print would look lovely on a baby girl too. 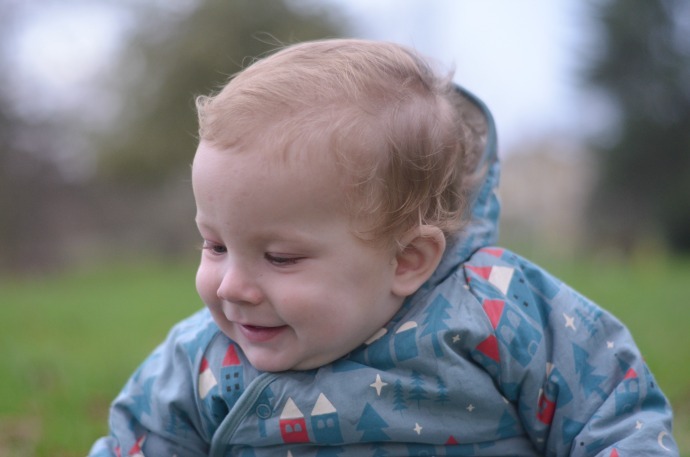 I am a big fan of organic clothing, and finding items that are made to be worn, last well and still be passed on and I have no doubt that this snowsuit will see plenty more babies through the winter once Finn has outgrown it. It has been worn a lot over the past few weeks, washed several times and it still looks and feels as good as new. 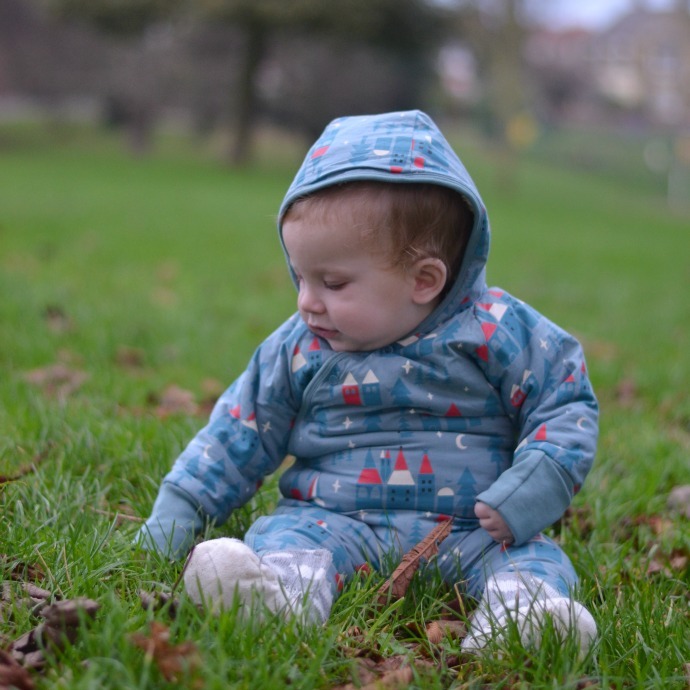 This snowsuit is currently priced between £46 and £48 depending on size - I think this is good value considering you are paying for an organic product made with fairtrade cotton and in ethical working conditions. The snowsuit is really well made and seems pretty durable so far. 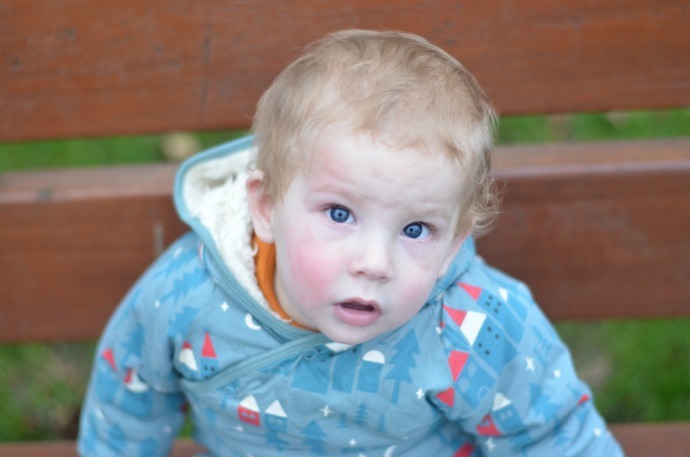 Thank you to Little Green Radicals for keeping Finn warm this winter. Oh he does look wonderfully snug and what a gorgeous print too!